On Monday, 19 January 1953, a mass darshan program took place at 8:30 A.M. opposite Dhanapathy’s residence, where a huge pavilion had been raised. The customary message of Baba’s bowing down and explanation about the Fiery Life was read out. Moving lectures were then delivered by the Meher Committee, the local Bar Association and the Gandhi Seva body, welcoming Baba to their town. The message from Baba on “Spiritual Freedom” was read out by Dhake and translated into Telugu by Kutumba Sastri. Then darshan commenced. Until 1:00 P.M., Baba gave darshan and handed prasad to almost 10,000 men and women. It resumed at 2:30 P.M. and went on and on until late that evening. About 20,000 had the good fortune of receiving Baba’s touch that day. 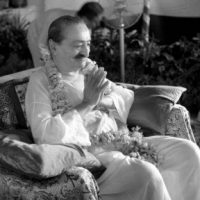 Bhaskara Raju sang bhajans continuously during the function, and in between Baba would give out certain explanations and messages. Baba’s words were translated into Marathi by Khare for the boys, and all 400 students came in turn for darshan. Baba patted some, placed his hand on the heads of others and kissed a few. Thus each of the boys had the advantage of receiving the God-Man’s love and caress.